I should like very much to go prying around in out-of-the-way places, redolent with the musk and decay of antiquity--but I've never had the time or money. TC editors advertising (I refuse to use the term “pimping”) their personal literary items for sale has a long history here on the blog. Check out this post by Leo Grin (and several subsequent). Times are dire here in serpent-haunted SEK. Musing on such, a decision was reached by yours truly. Time to lighten the load for the journey into the future. One would have to look hard for a more fitting story to commemorate the anniversary of the passage from this mortal coil by the Man from Providence. Lovecraft always seemed fond of the tale, and Robert E. Howard expressed his deep admiration for it at least once. While an “update” in temporal terms, the short film seems to capture a bit of the atmosphere that the Great Old One strove for. 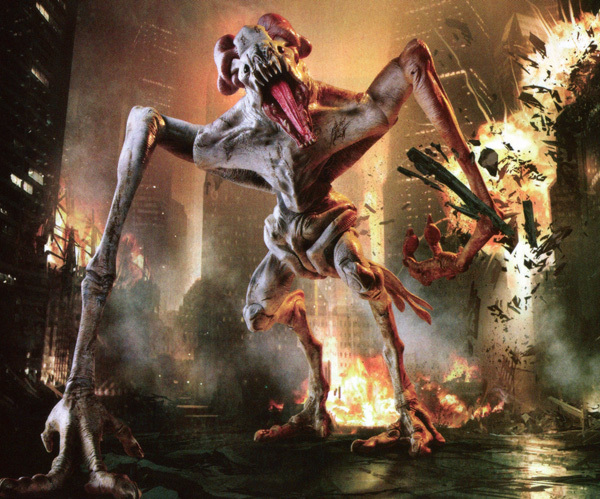 Nothing rings in the holiday season like cosmic horror. So, without further ado, let’s look at upcoming publications featuring either the works of the Man From Providence or those of his acolytes, all of which bear some connection (sometimes tenuous) to Our Reason For Being here at The Cimmerian. All of Lovecraft’s fiction from the original run of WEIRD TALES, in facsimile form right off the original pulp pages! 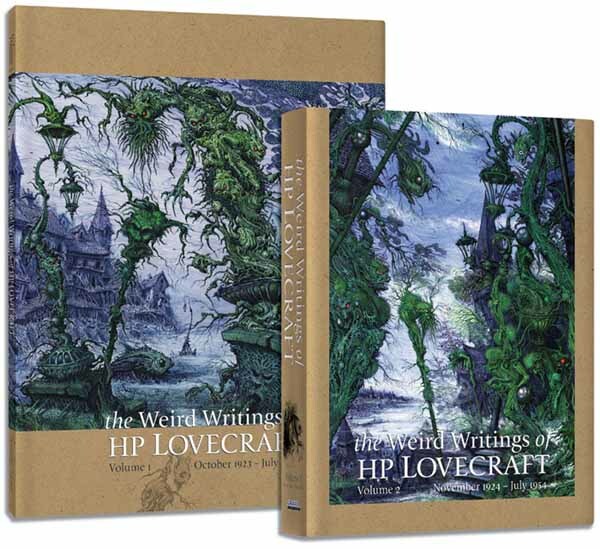 Girasol Collectables is pleased to announce their upcoming hardcover project, which will be the Weird Writings of HP Lovecraft. It’ll be similar in format to their REH books; facsimile scans right from the original pages, with no edits or reset text, containing all of HPL’s material from the original run of WEIRD TALES. A 2 volume set, with one oversized volume to cover the bedsheet issues from 1923 and 1924, and a smaller 7×10 sized volume for the standard sized issues. We’ll do our best to match existing numbers for REH buyers, but can’t guarantee it; get in early for the best chance at that. 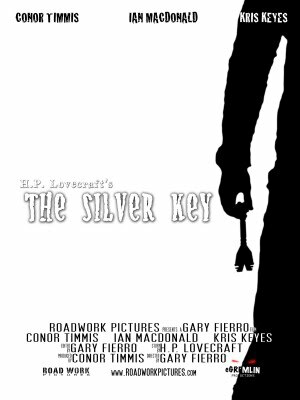 Due out Spring of 2010. 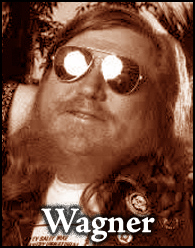 Karl Edward Wagner (1945 -1994) died fifteen years ago today. I never knew Karl. Nevertheless, his work as an author, essayist, editor and REH scholar has affected my views regarding the entire field of weird literature since I was barely a teenager. I believe that he should be remembered and due attention paid. 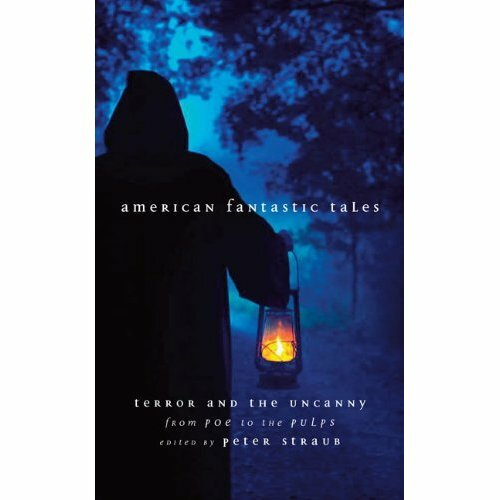 That’s the lead-in list of authors on the Library of America site for their forthcoming edition of American Fantastic Tales: Terror and the Uncanny From Poe to the Pulps, edited by Peter Straub. 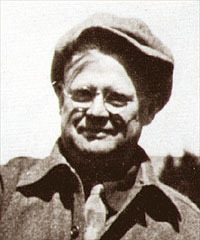 Apparently, Robert E. Howard rates in the “Top Ten” of American weird/horror authors (published prior to 1940) out of a total of forty-five. We are grading on the curve here, but in a good way. Since one would assume all authors in a Library of America collection should be “A-List” writers of some sort, Robert E. Howard would seem to be in the “A+” grouping. In certain surroundings our entire being is made of eyes, every atom dilates to witness the haunting of the universe. A good critical overview or survey is courteously coercive in that we feel obligated to impose some sort of order and consistency on our own opinions. Having spent the better part of two weeks thinking about S. T. Joshi’s The Rise and Fall of the Cthulhu Mythos — better because the alternative was redrafting various cover letters yet again to try and suppress their ghostly, single-song soundtrack of “Brother, Can You Spare A Dime?” — I’d like to follow up Part One, which mostly engaged with Joshi’s comments on Robert E. Howard’s Mythos work, and Part Two, a wide-ranging look at Rise and Fall‘s treatment of “everyone else,” with subjective and selective suggestions about Mythos-mining. Those who can, do, and those who can’t blog; I’m about as qualified to offer such suggestions as were the walking loyalty oaths and newly-hatched ideologues who found themselves brattily supervising entire Iraqi ministries or provinces during the heady summer of 2003. But if nothing else, this Part Three has been a pretext for some enjoyable re-reading and re-watching. Filed in Fantasy Films — HORROR — Lovecraft, Howard Phillips — OTHER AUTHORS — Saunders, Charles R. — Smith, Clark Ashton — TOLKIEN, J.R.R. If you decide to write a Conan pastiche, chances are you are going to wind up having the mighty Cimmerian swear “By Crom!” a few more times than Howard did per story. You will probably increase the quotient of “skull-cleaving” blows, etc. Since the smaller details of the warp and woof of Howard’s style work so well hypnotizing you as you read, you cannot quite identify or explain them, and thus you cannot quite take aim at them to imitate them in your pastiche. To compensate, you lean more heavily on the most obvious stylistic trademarks and hope the reader will think it sounds like the real thing. This is of course the reason, also, for the way many fan Mythos pastiches turn out. 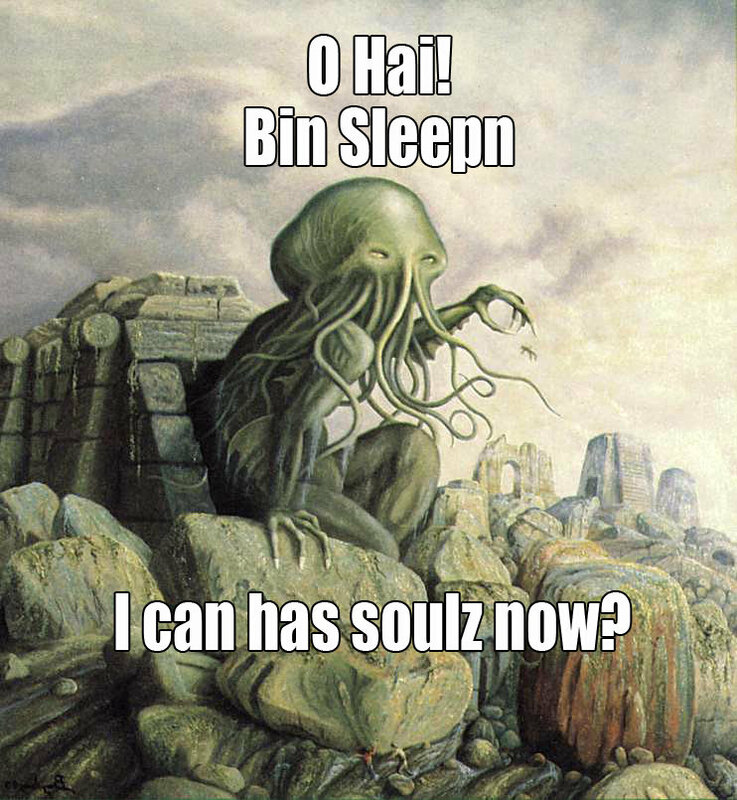 As immature writers, their authors cannot account for what it is in Lovecraft’s stories that grabs them so. So they go overboard, with the most blatantly obvious feature, the Mythos names and monsters. The pitiful result only makes it all the more obvious that this was never really the secret at all. Think back to the fall of 1944, weeks before the Third Reich’s last great offensive got rolling in the Ardennes. That’s when Fritz Leiber, writing in the pages of The Acolyte, called for “a detailed study of the growth of [Lovecraft’s] Mythology and the background, and also an appraisal of the extent to which it helped or hampered Lovecraft’s writing.” From that perspective The Rise and Fall of the Cthulhu Mythos has been a long time coming, but earns the admiration of weird fiction enthusiasts by succeeding as an introduction to, and also an interrogation of, both the original Lovecraft Mythos (to adopt the Joshi-endorsed term) and what he memorably terms “that heroic task of literary misconstrual,” the Derleth Mythos. Way back in The Weird Tale, Joshi complained that “the bulk of recent critical work (not merely in this field but in most others) seems so cheerless, mechanical, and obfuscatory that the reader is likely to be repelled rather than attracted to the subjects of study.” Not so the readers of this book, lucky recipients of a text that is elegantly written (although a reference to the “United States’ secession from England” is a brow-furrower), eloquently argued, and commendably inclusive. 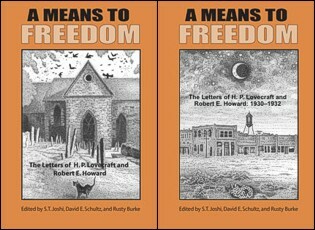 In a February 17, 2009 review of Kenneth Hite’s lively Tour De Lovecraft at his blog, John D. Rateliff identifies that book’s drawback as an assumption that readers are “thoroughly conversant with every tale Lovecraft ever wrote; if you can’t instantly recall, say, ‘The Tree’ or ‘He’ in great detail, then you’ll be a bit lost.” That’s not true of Rise and Fall (Rateliff, incidentally, provides a link to his own persuasive case for The Dream-Quest of Unknown Kadath, but also steps in albino penguin droppings by deeming At the Mountains of Madness “a tedious bore that would have been better at a quarter of its bloated length.” The preference for Dream-Quest is to be expected from a fantasy-esteemer, but “tedious bore”? Is it possible that Farnsworth Wright has pulled a Joseph Curwen on Rateliff?